We actually had two weeks’ worth of “B,” based on “bears” (mostly) and “balls” (secondary). 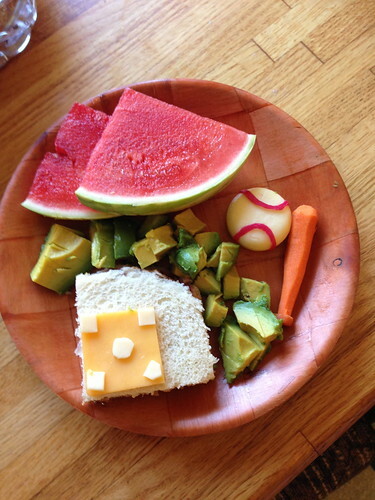 I made a baseball field cheese sandwich, carrot bat, and Babybell baseball (inspired by this post, although I don’t have a food safe marker). 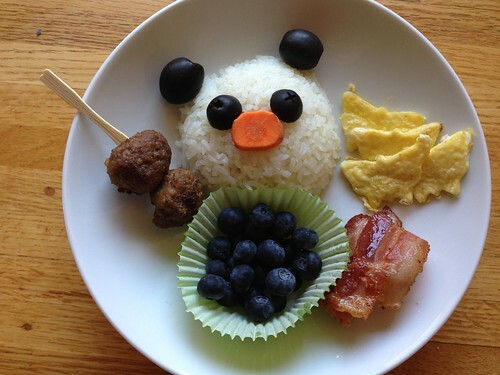 We had meatballs, blueberries, bacon, egg butterflies, and a panda bear made of olives, rice, and a carrot slice. 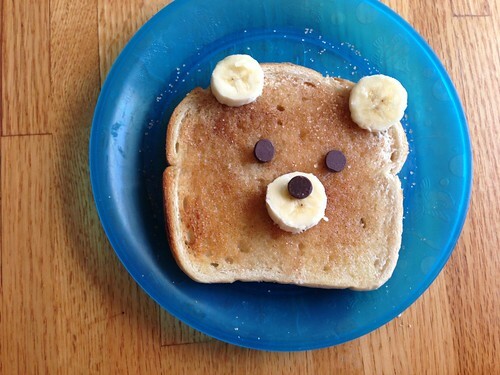 I saw a cute cinnamon bear toast picture on Pinterest. We used chocolate chips, though, because we didn’t have raisins. 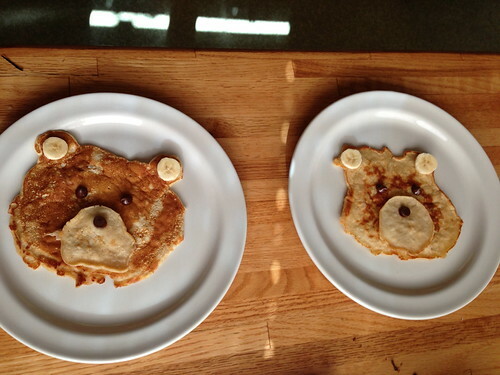 The boys loved this so much, they requested it a few more times for breakfast. 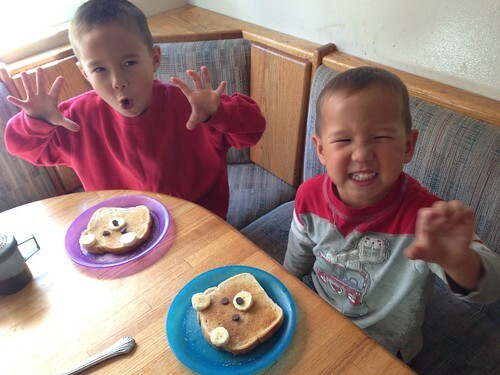 They gave me good bear roars in response. 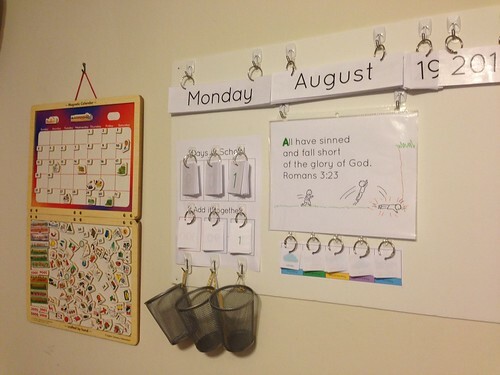 Steven learned Zoo-phonics in preschool last year, so we’ve been continuing to use their animal sounds and actions for the letters. 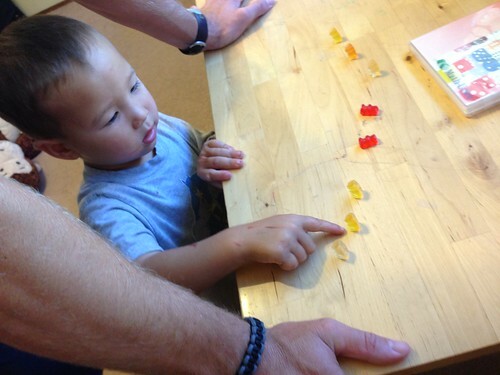 We used gummy bears to count to ten with the 3-year-old. We also used foam blocks for counting. 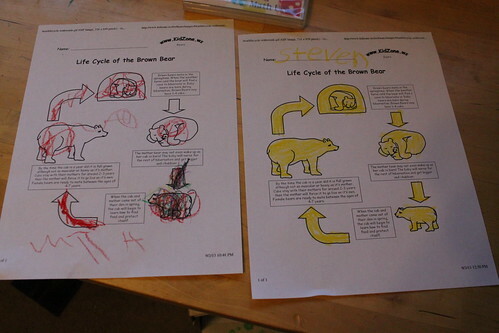 For science, we checked out books about bears from the library, and read and colored this printable about the life cycle of the brown bear. 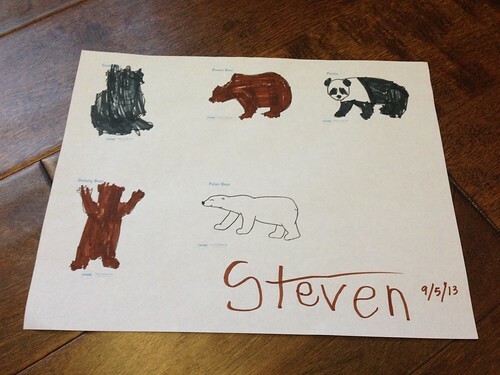 I found these bear coloring sheets and printed them, sized down, on a single sheet so that Steven could look them up in his library books and figure out how to color them. 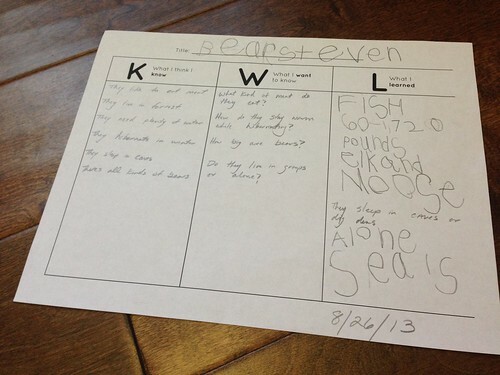 Steve and Steven also filled out a KWL sheet about bears before and after reading the library books. Finally, the boys made a “bear cave” out of couch cushions and pillows, but I forgot to take a picture! 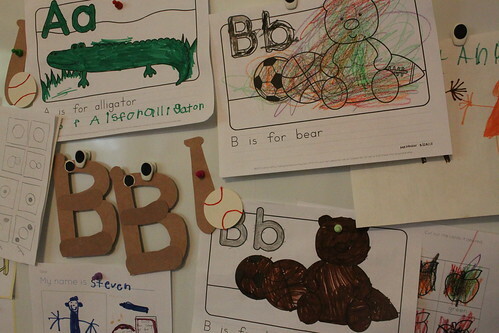 A fun thing that we did the second “B” week was to read all of Bonny Becker’s “bear” books, one each day, and to do different activities related to the books. 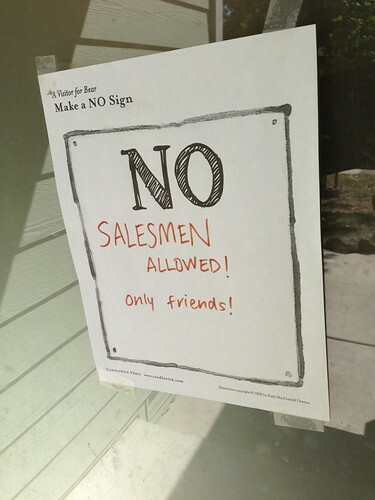 We also printed out a “no” sign from the Candlewick press activity kit (link to PDF) and Steven decided what to write on the sign. The next day, we read A Bedtime for Bear. 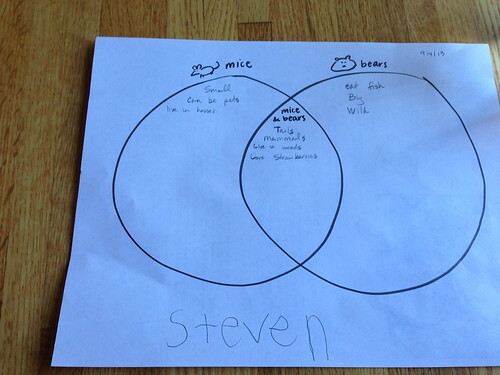 Steven was introduced to the concept of a Venn diagram, and we filled it out for bears and mice. 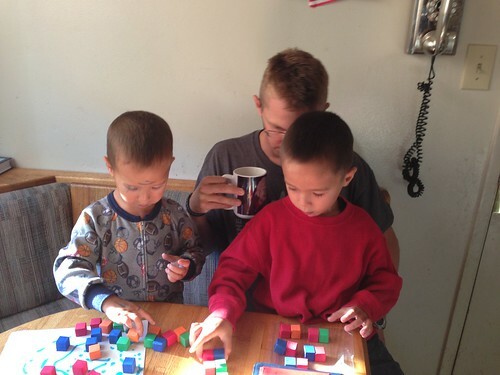 We also talked about bedtime routines, and I had Steven and Matthew tell us things that we did before going to bed. 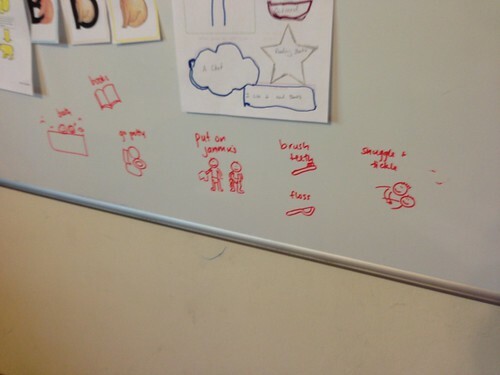 On Wednesday, we read The Sniffles for Bear. 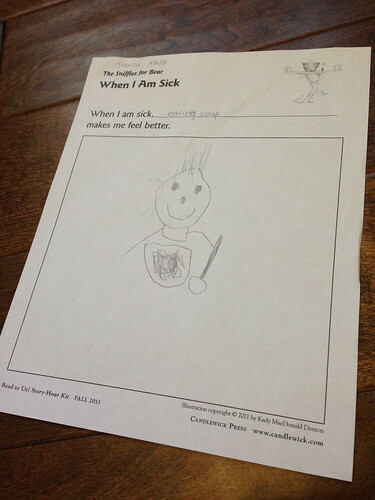 I printed out one of the pages from Candlewick Press’ activity PDF and Steven drew a picture and dictated. 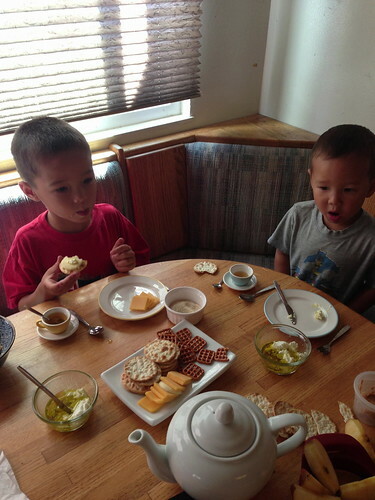 Then we went to the store and the boys got to pick out their own can of soup for lunch! On the final day, we read A Birthday for Bear. 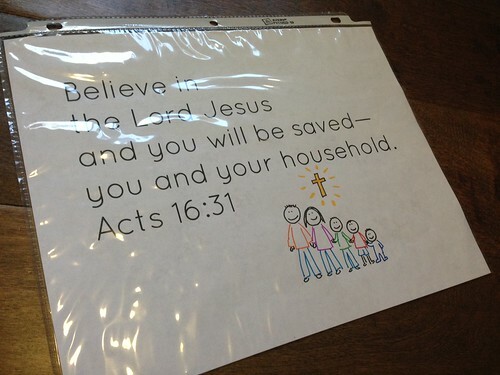 We looked at upcoming birthdays on the calendar and the boys made a birthday card for one of our friends. Of course, we also checked out and read all kinds of bear books from the library (and pulled out all of our own bear-related books). We especially love all of Karma Wilson’s bear books (Bear Snores On, etc. ), Phyllis Root’s Oliver Finds His Way, and Jon Klassen’s I Want My Hat Back. Anna the Red: 20 easy bento for kids! Another Lunch: Bento: San Francisco Giants win the World Series! Since it’s the start of a new month, I whipped up a quick printable for the boys to fill out with information about themselves, including space for a self portrait. I’m excited to see what changes (or doesn’t change) from month to month! Finally, “F” is for “fish”!